Hello gorgeous people!! Today my blog is about something different but very very important. 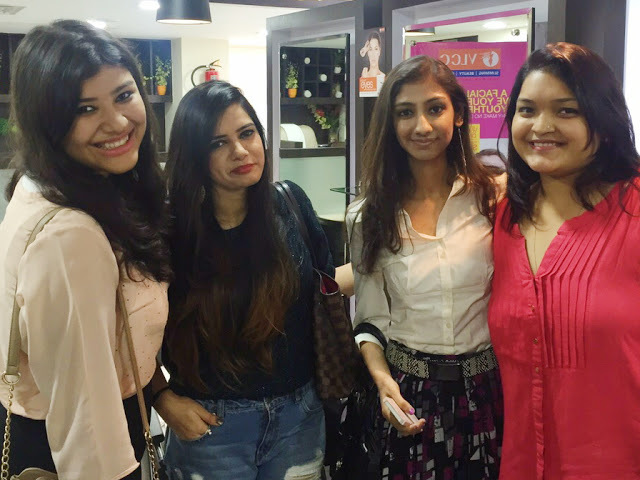 Last week I had attended a bloggers meet conducted by VLCC and I was happy about all the information I had got at the end of the program. VLCC is a beauty,fitness and wellness brand known both nationally and internationally and works wonders on people. They are located in 17 countries. I had heard of VLCC as a weight reduction brand but now I know how wonderfully it works on our skin as well. 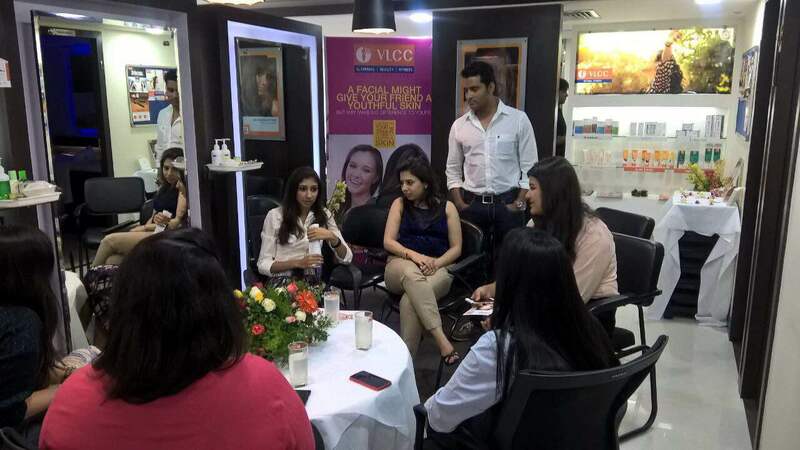 VLCC DNA SKIN is a newly launched skin program which works on your skin based on your DNA. 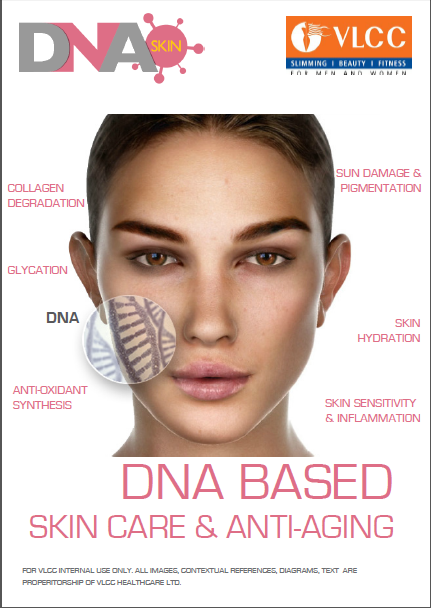 Our DNA is 70% of how our skin is and the rest 30% of external environmental factors. 1) Collagen Dehydration/Synthesis- For skin firmness which reduces as we age. 2) Antioxidants- These are produced by our body to protect it from free radicles and aging. 3) Skin Hydration – this is the ability of the skin to hold water. 4) Sun Protection- UV radiations cause damage to the skin.It causes reduction of collagen which can damage skin cells. The skin has certain proteins to repair the skin from such damage. 5) Skin Sensitivity/Inflammation- inflammation means our body is allergic to something. Due to the genes some people’s skin is very sensitive. 6) Glycation- Excess sugar in the skin causes damage to collagen causing ageing earlier than time. VLCC has thus come up with a program which helps solve all your skin issues by checking the root/internal cause of the problem i.e., through your DNA. They check your medical history,your lifestyle and then have a panel of doctors trying to discover the issue right from the basics and then come up with a customised treatment for it. Isn’t that lovely? This treatment is more personal and works well and also they give you charts and instructions of lifestyle changes you need to make and also have a report of whats excess in your skin and how it can be got down. The treatment for sure is going to work well as they work on the root cause of the problem and with a lot of research come up with the solution. Dr.Yasmin was the person who explained all this to us very wonderfully and also told us how this program is very personalised. It is more personal as everyones DNA makeup is different from every individual.The treatment which worked well on me having a similar problem to yours may work differently on you because of your different DNA makeup. DNA Slim is a similar program which works for fitness and weight loss on the same basis as above. Im glad that such scientific,personalised and advanced forms of treatment are now available. I hope this blog was informative. You can rush to your nearest VLCC centre for consultations and treatments. They also have other things like facial,yoga,ayurvedic treatments and you will definitely feel better than before.